Description On road ride. Sealed. Light traffic. One extended climb. Start/finish Corner of Bruxner Park Road & Pacific Highway. Start at the top of Bruxner Park Road for an easier ride option. Highlights Banana farms, spectacular views, bushland and farmland – this ride is one of the hidden gems of the Coffs Coast. 3km steady climb (300m) winding road, to the saddle at Bruxner Park Flora Reserve (‘The Gap’). Light traffic, sensational views. Fast descent through a cool pocket of rainforest, emerging into more open, ‘rolling’ countryside – a mix of woodland and farmland all the way to the intersection with Bucca Road. Return same way. Caution required on descent on Bruxner Park Road. 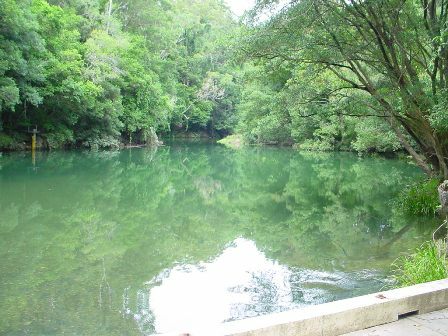 There are walking trails and picnic facilities in Bruxner Park Flora Reserve. Description On road. Sealed. Light traffic. Highlights Winding, undulating ride through peaceful and scenic countryside. Head east out of Coramba village, over the river and under the railway, then turn left into Eastbank Road. Alternatively take a shortcut down Martin Street (next to the park). Take care crossing the river and then the level crossing. Turn left into Eastbank Road. At Bucca Road, turn left and travel 2km into Nana Glen village. Caution required on wooden bridges, level crossing, and winding sections. Description “Around the block”. It’s just a big one! Popular on-road ride for experienced sport and touring cyclists. Sealed, rural roads. Traffic conditions vary. This ride includes Bruxner/Bucca T and Eastbank Road routes. Highlights A ride with ‘the lot’. Ups and downs, bananas, rainforest, bushland and picture-postcard farmland scenery. Head north on the Pacific Highway, past the Big Banana. Turn left into Bruxner Park Road. It’s a steady 3km climb to the Bruxner Flora Reserve ‘saddle’. 10km to Bucca Road, and then a further 12km to Nana Glen. Head south again along Coramba Road which has moderate traffic with limited shoulders. Then take care on the steep descent down Red Hill as you head back into Coffs Harbour. Distance 16km loop (26km option). Description On road route, suitable for all bikes. Light traffic, some climbs. Start/finish Karangi Public School. Near corner Coramba Road & Upper Orara Road. Highlights Classic scenic ride through rural countryside. You can do this Upper Orara Road/Mount Browne Road circuit either way. Complete loop involves 3km along Coramba Road, which has moderate traffic, and no shoulder in parts. Add 10km for the South and North Island Loop Road circuit! On a hot day cool off in the waterhole in the Orara River where North and South Island Loop roads meet.